Believe it or not, the ominously named Huevos Divorciados come with the ability to keep the peace at the breakfast table. There won’t be anything to fight over as this dish is traditionally served with two freshly made Salsas. Yes, two! This will accommodate all palates and ensure that everyone leaves the morning summit a happy camper, even if they’re starting the meal on opposite sides of the table. The potatoes will take the longest of all the elements, so it’s best to start with those. And since this is a typically a breakfast dish I’ll be using the oven as much as possible, i.e. still waking up and don’t want to work too much. 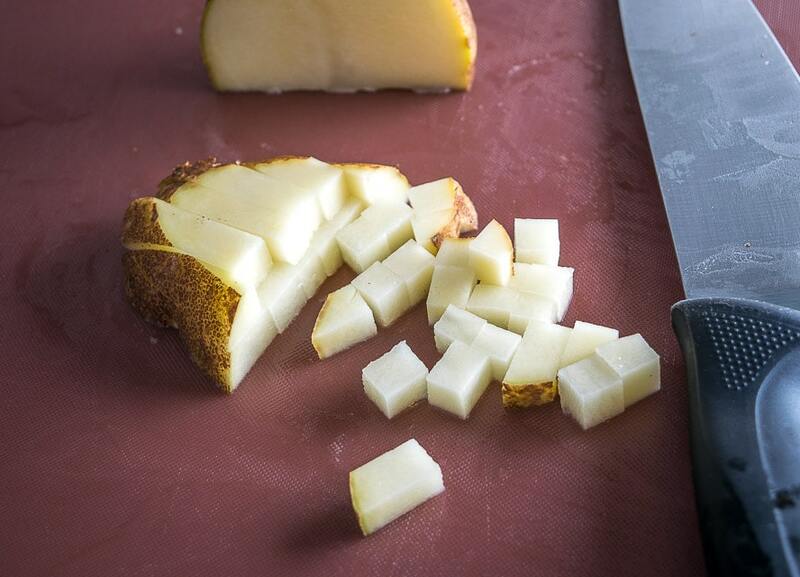 Dice up a potato into 1/4″ cubes. You can press the cubed potatoes into some paper towels to get rid of some of the moisture, but sometimes I skip this step and still end up with a good result. Combine all of these ingredients in a mixing bowl. I find it easiest to cover the bowl with plastic and give it a good shake. Form a single layer on a sheet pan and bake the potatoes for 20-30 minutes in a 400F oven. You can use parchment paper for easy cleanup if you want. I usually give them a stir halfway through as the bottom side will tend to crisp up the most. 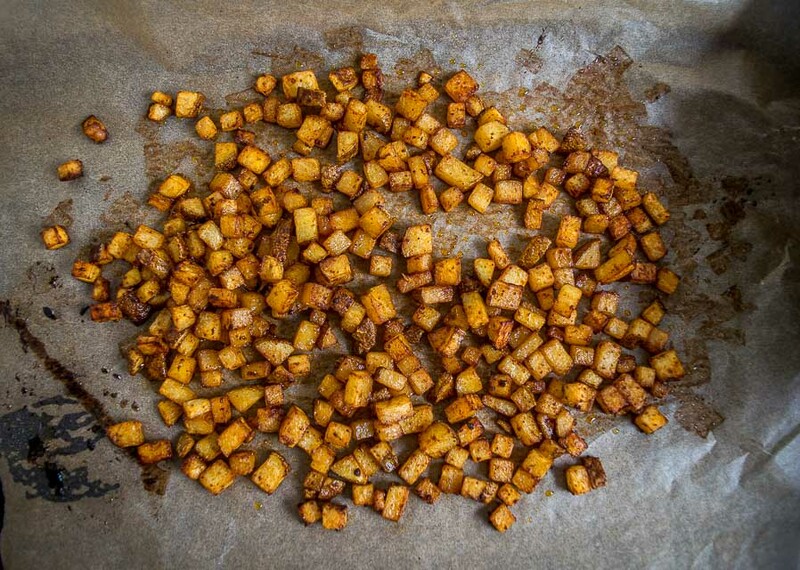 But don’t try to bake them until they are crispy enough to mimic fried potatoes — it won’t happen! There’s a middle ground where the insides are tender and the outside is partially crispy and I am usually happy with that. Once the potatoes are in the oven you can start roasting the ingredients for the Salsas. 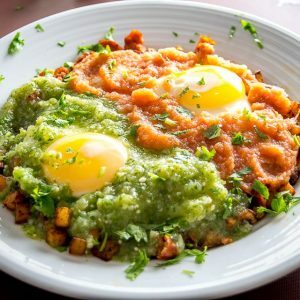 Huevos Divorciados is typically served with both red and green Salsas, so we’ll be using our Salsa Roja (Tomato Jalapeno Salsa) and our Salsa Verde for this recipe. These Salsas are incredibly easy to make and they are both great additions to your kitchen arsenal. For both of these Salsas, I tend to roast the tomatoes and tomatillos in the oven but leave the other ingredients raw. Of course, you are welcome to roast the onion and peppers if you’re in the habit of doing that. Tomatoes typically need 20-30 minutes in the oven and tomatillos about 15-20 minutes. You can take the tomatillos out when they turn army green in color, but sometimes I just leave them in until I need them. Combine well and taste for heat level. If you want to amp it up you can always add the other half of the jalapeno. And don’t forget that you can always substitute serranos for jalapenos if you want. But don’t eat it all yet! Sometimes I’ll add a pinch of salt to this Salsa but it depends on the tomatillos. I didn’t add any salt to this batch. Combine well and taste for heat, adding more jalapeno if you want. Sometimes the flavor of this Salsa will vary based on how fresh the tomatoes are. If it’s not deliciously vibrant out of the blender then you can always give it a 5-10 minute simmer in some oil over medium heat. This will further sweeten up the tomatoes and help it reach its full potential. To keep things simple, I usually just plop a chorizo link on the same sheet pan as the potatoes and bake it for 20-25 minutes or until cooked through. Okay, let’s cook some eggs! Sunny side up and over easy are both great choices. The bites that have egg yolk dripping over Salsa drenched potatoes can alter the course of any war, so I recommend starting with one of these options. Heat up a skillet over medium-low heat. I usually add both oil and butter to the pan. Gently crack the eggs into the pan. The recipe box below is enough for 2 people (4 eggs) but I find it easiest to cook the eggs two at a time when runny yolks are at a premium. 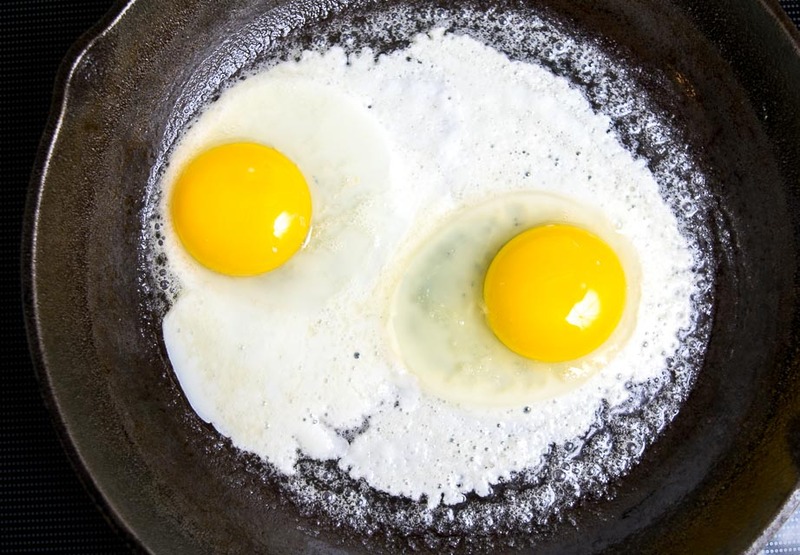 For sunny side up, cook until the whites are set. You can partially cover the skillet with a lid or foil to help accelerate this. Or you can flip them over and briefly cook the other side if you want your eggs over easy. 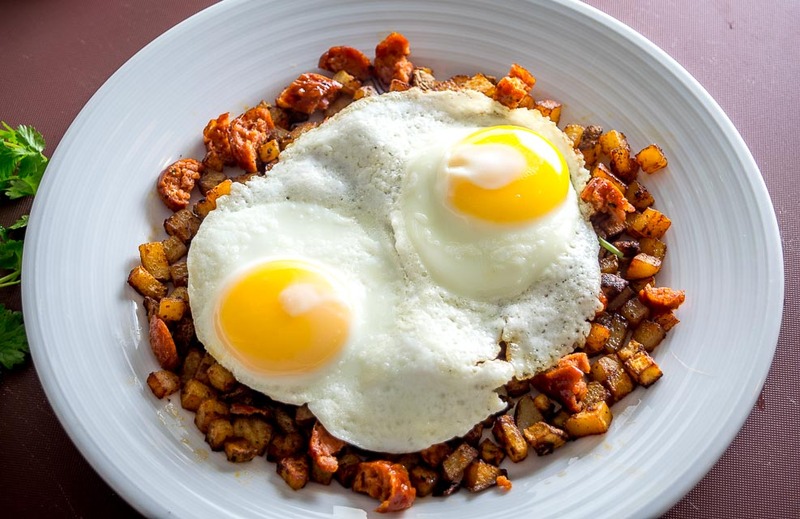 When the eggs are almost done cooking, form a single layer of potatoes and chorizo on a plate. 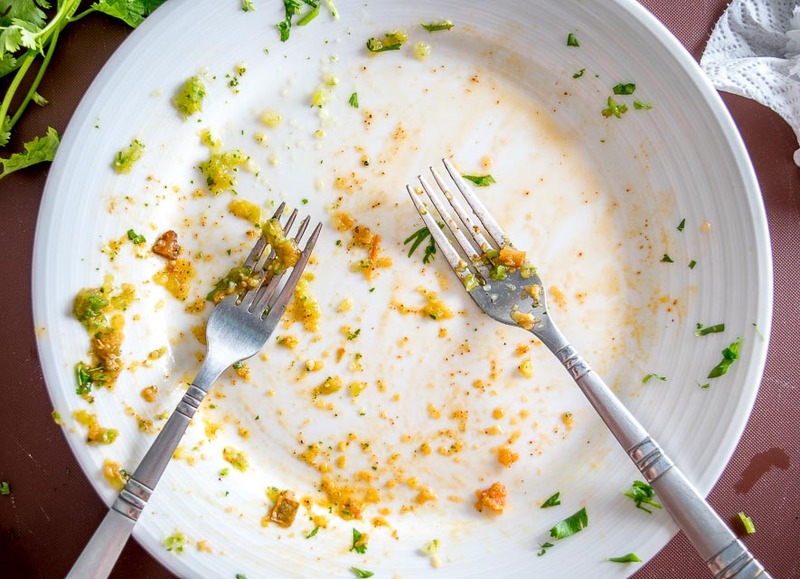 You can serve on individual plates, or for more desperate situations you can serve everything on a single, larger plate to encourage peaceful interaction. Add the eggs and then load them up with your freshly made Salsas, half red and half green. I also like some freshly chopped cilantro on this dish so consider adding some as a final garnish. For cilantro, I typically twist off and discard the bottom, thicker stems but use the upper stems that hold the leaves together. And both parties will walk away with a bounce in their step and a fresh outlook on life. Huevos Divorciados for the win! 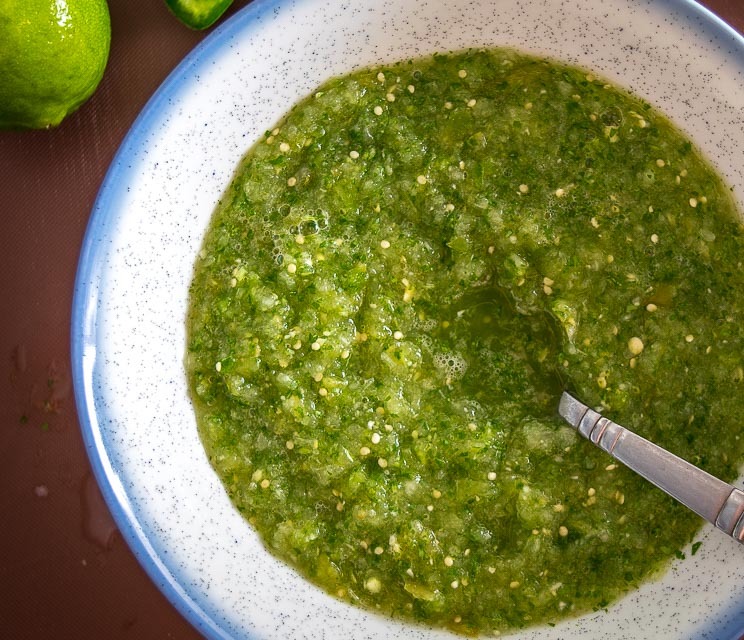 Okay, let me know if you have any questions about the homemade Salsas — they are the key to this dish and once you add them to your repertoire you’ll always have the option of whipping up some Huevos Divorciados for breakfast. Or dinner. Or peace summits. 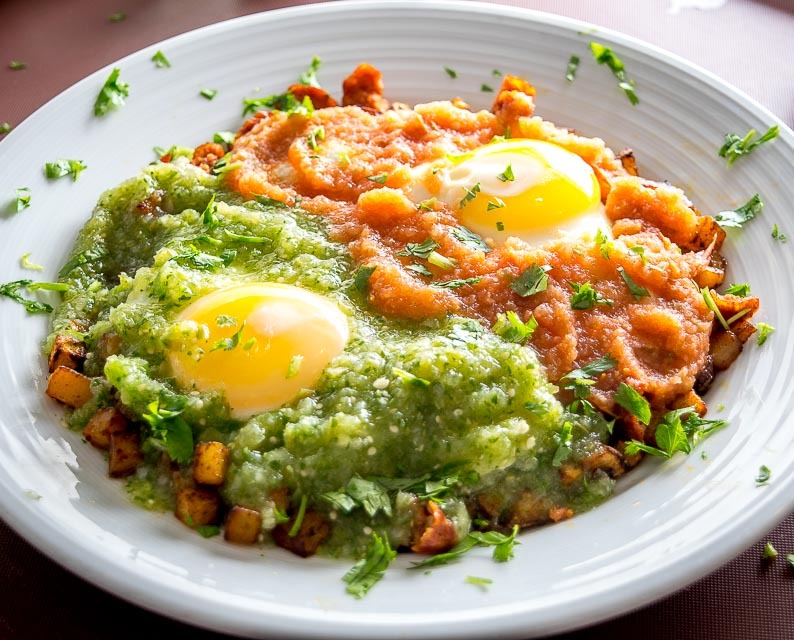 This classic Mexican breakfast dish is served with two freshly made Salsas -- yes, two! I use a bottom layer of potatoes and chorizo, but corn tortillas are also a good option. I usually start with the potatoes as they will take the longest to cook. 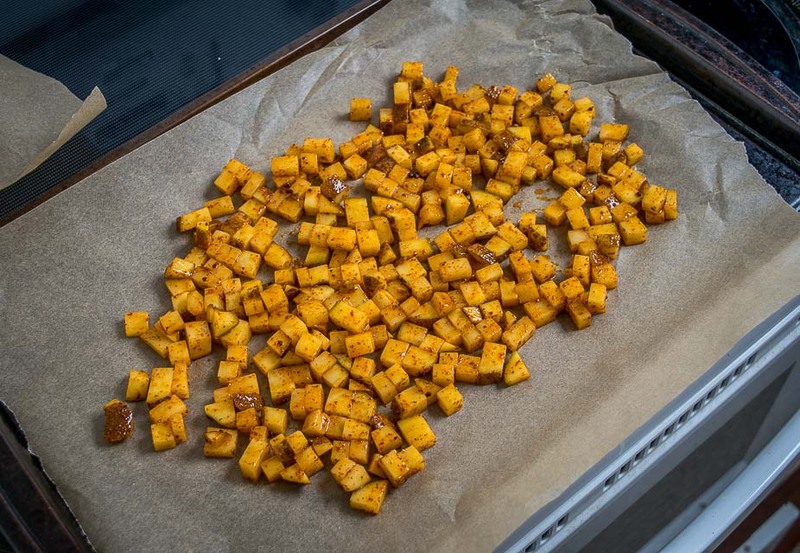 Rinse and dice the potato into 1/4" cubes. 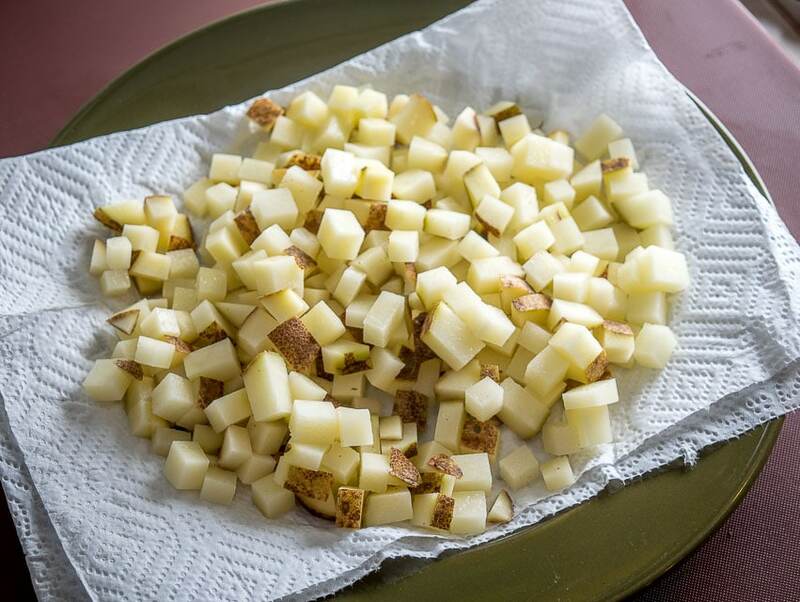 You can optionally press the diced potatoes into some paper towels to get rid of some of the moisture. 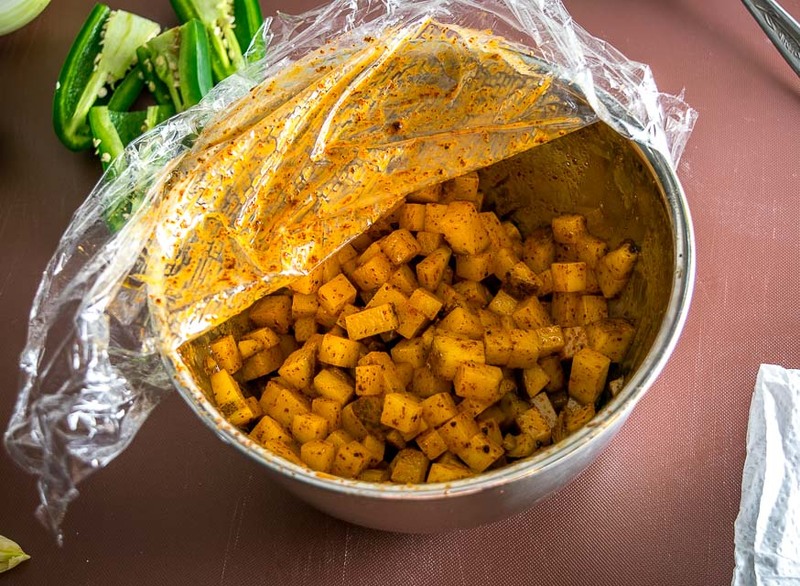 In a mixing bowl combine the potatoes with 1 teaspoon chili powder, a pinch of garlic powder, 1/2 teaspoon salt, freshly cracked black pepper, and 1-2 tablespoons oil. Cover with plastic and give it a shake until the potatoes are coated with the seasoning. Form a single layer of potatoes on a sheet pan and bake for 20-30 minutes at 400F. I usually give them a stir halfway through. Once the potatoes are in the oven you can start roasting the tomatoes and tomatillos. Take the husks off the tomatillos and give everything a good rinse. I usually de-stem the tomatoes and tomatillos knowing that any juice leftover in the roasting pan will go into the blender. 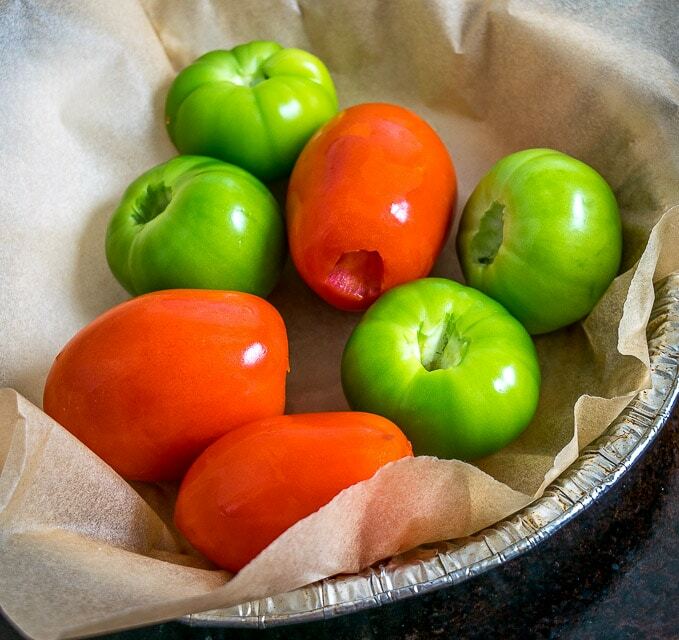 Roast the tomatoes and tomatillos in the oven for 20-30 minutes. The tomatillos will typically need less time so you can take them out when they turn army green in color if you want. 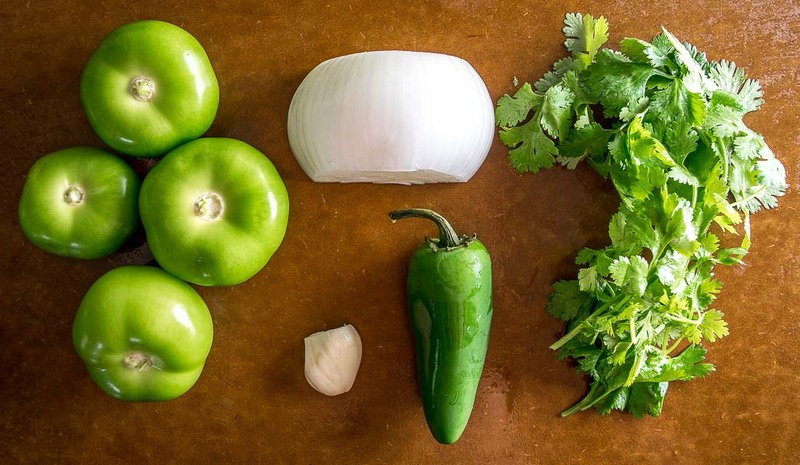 For the Salsa Verde, add the roasted tomatillos to a blender along with 1/2 onion, 1 peeled garlic clove, 10-12 sprigs cilantro (using the upper stems is fine), and 1/2 of the jalapeno pepper. 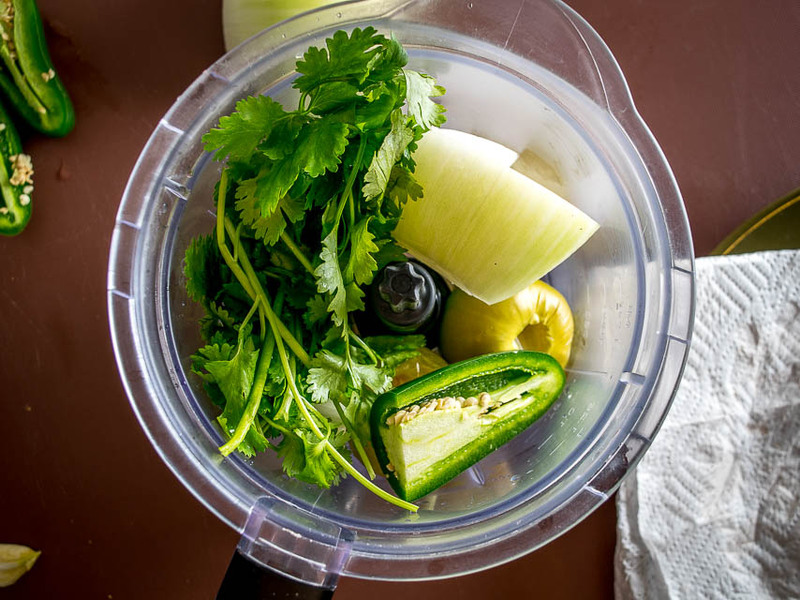 (Be sure to give the cilantro and jalapeno a good rinse.) Pulse blend and taste for heat level. If you want more heat add the other half of the jalapeno. Salt to taste. 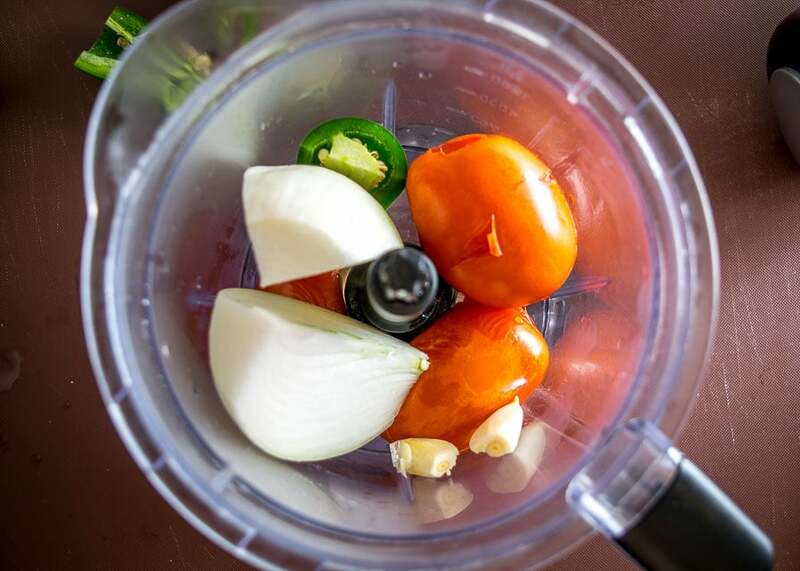 For the Salsa Roja, add the roasted tomatoes to a blender along with 1/2 onion, 1 peeled garlic clove, and 1/2 of the jalapeno. Pulse blend and taste for heat level. If you want more heat add the other half of the jalapeno. Salt to taste. If this Salsa is not deliciously vibrant out of the blender I will simmer it in some oil for 5-10 minutes over medium heat to sweeten up the tomatoes. For the chorizo (optional) I typically plop the chorizo link on the same baking sheet as the potatoes. Bake for 20-25 minutes or until cooked through. For the eggs, heat up a thin layer of oil in a skillet over medium-low heat. I also typically add a knob of butter but this is optional. Gently crack the eggs into the pan. For sunny side up, cook until the whites are set, partially covering the pan if you want. For over easy, flip and cook the second side briefly. 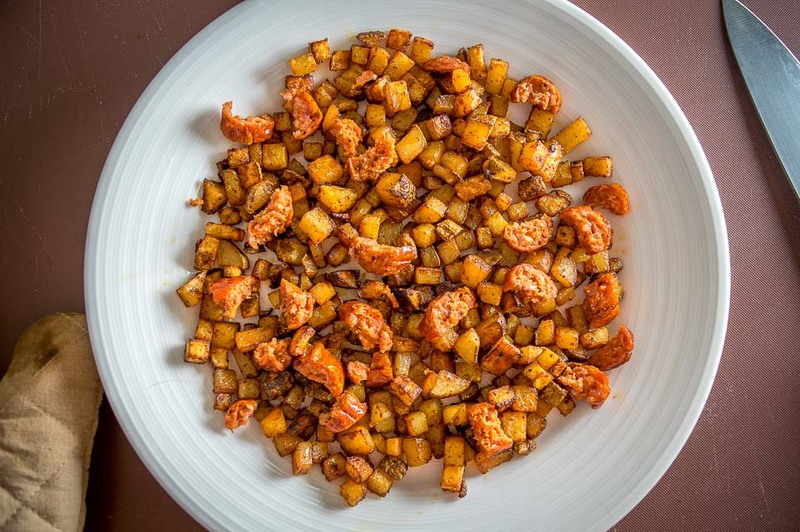 Add a layer of potatoes and diced chorizo to a plate. This recipe is designed for two people and you can either serve on individual plates or one larger plate. Add the eggs and cover them in the freshly made Salsas, half green and half red. Serve immediately and optionally garnish with freshly chopped cilantro. You'll have plenty of leftover Salsa. Store it in the fridge in airtight containers where it will keep for a few days. Alternatively, you can serve the eggs over corn tortillas and refried beans. See our Huevos Rancheros post for tips on frying the corn tortillas. 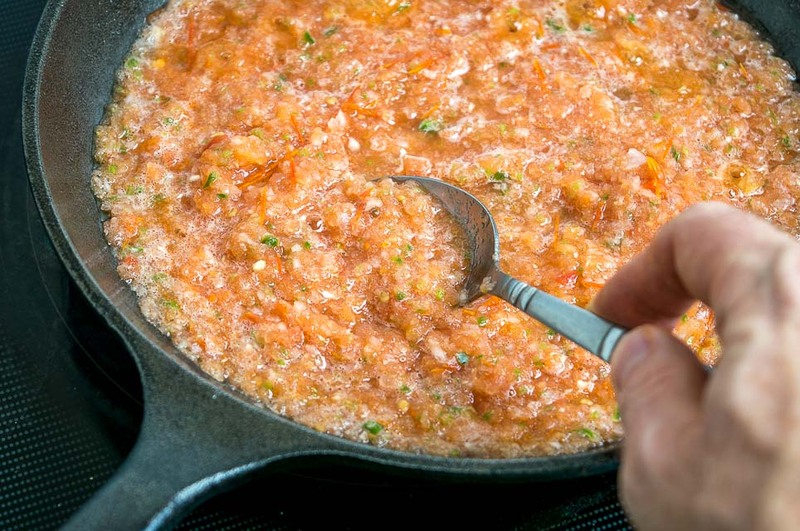 A final simmer is a good tip to keep in mind for the Salsa Roja. If the tomatoes were struggling then a 5-10 minute simmer will sweeten up the tomatoes and concentrate the flavors. I like to use pure chili powders with no additional ingredients. 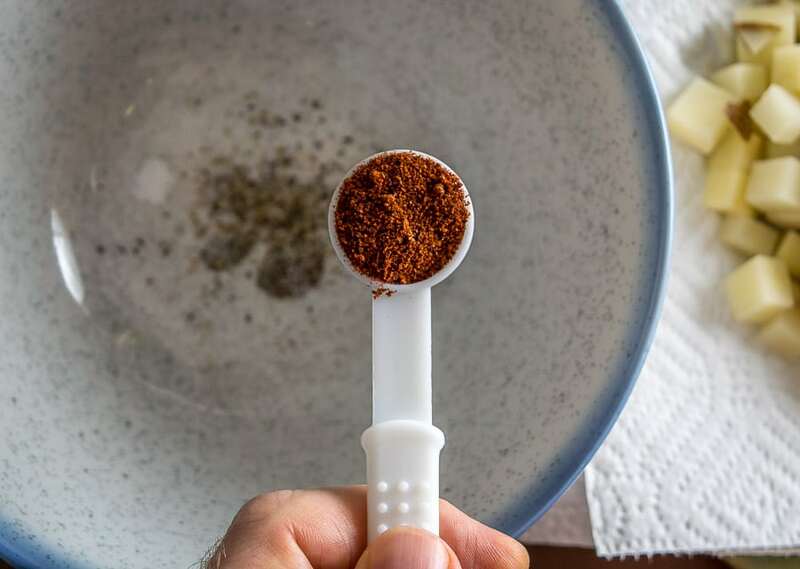 Here are some tips on upgrading your chili powder. 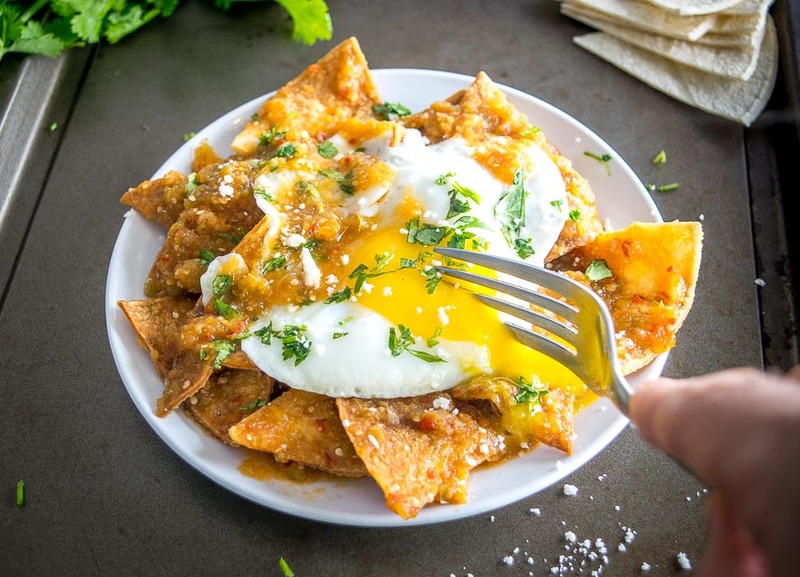 Prefer Chilaquiles? 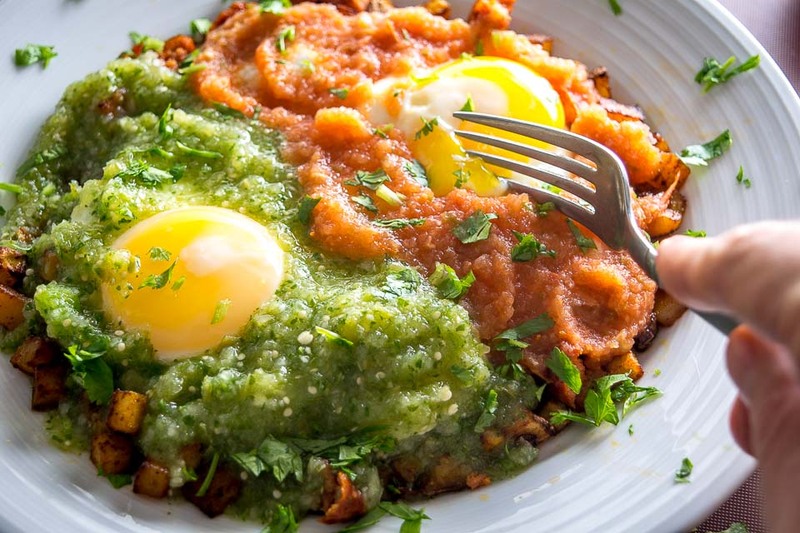 Try our Chilaquiles with Tomatillo-Chipotle Salsa. These eggs sound wonderful. I’ve heard of them before, but not served over potatoes & chorizo, which I would prefer, because we like a substantial breakfast. Thank you also for your explanation of chili powder. I will definitely try that (I’m one who does not have much appreciation for cumin, because people usually use far too much of it). Thanks Susan! Yeah I’ve become a huge fan of real deal chili powders, they give you so much more flexibility because they’re not loaded with other ingredients. Nice variation with the bed of chorizo and potatoes! I made this recipe for lunch and my wife loved it. I only couldn’t find any tomatillos (they’re not very common around here), so I substituted the salsa verde with guacamole to keep the color theme. I guess it worked.